Like a tipsy outfielder squinting into the sun during an eclipse, I’m dropping a lot of balls. My husband says I’m the most disorganized organized person he’s ever met, while my friends have suggested I’m in need of a calendar revamp. They may be right. My inability to sync my multitude of calendars plays a key role in this disorganized tale. In order to reinstate some balance to my topsy turvy schedule, the first thing I need to do is find a cohesive calendar solution. My current (flaky) system has not been serving me well. The fact that I actually have “Learn how to sync calendars” written on one of my calendars… is laughable. Calendar 2: the wall calendar in my office where you need to actually write things down in order to remember them; like birthdays. FYI, friends don’t think it’s cute or charming when you miss important milestones in their lives. Go figure. Calendar 3: on my iphone. Syncing and the whole icloud situation have me dazed and confused. I’m so discombobulated that last week I showed up for a meeting early. An entire day early. Calendar 4: the master calendar on my computer which would have been a handy place to jot down the date of the party we missed. I neglected to RSVP to said party because the invitation was hidden out of sight, lost under my handwritten To-Do list. Oh the irony. After picking up the kids from school, we ran a few errands and then headed to the grocery store. Thankfully I checked my email before we went in. There was a message from Bryan — he was sitting in front of my house, melting ice cream imminent, asking politely if I’d be home soon. Oh for the frig, I’d done it again. I sent him a harried message telling him I’d be there in five and sped for home. Imagine my embarrassment when I arrived to find this nice guy waiting outside my house, frozen cake in hand. Bryan drove all the way from the city to deliver this beautiful cake and I nearly missed out (not to mention putting him out) due to my inept scheduling. And can we talk about this cake for a minute? 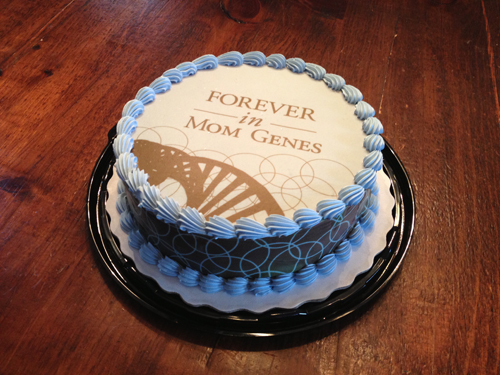 Why yes they did ice it in the denimy blue of my blog and customized it with FOREVER in MOM GENES in brown. Seriously? Awesome. And it tastes as good as it looks. I let my son cut the first slice (that’s his handy work on the left) while somebody, I’m looking at YOU my sweet angelic daughter, snuck a few licks while I was taking photos. Even without the photographic evidence, the blue icing moustache was a dead give away. Tasty, pretty, customizable and convenient: we give these cakes two (sticky) thumbs up. Even the most disorganized person, ahem, can easily design and order one online for any occasion…like say that birthday that you totally didn’t forget. Want to try one of these cakes for yourself? can customize your own cake at www.dqcakes.com.